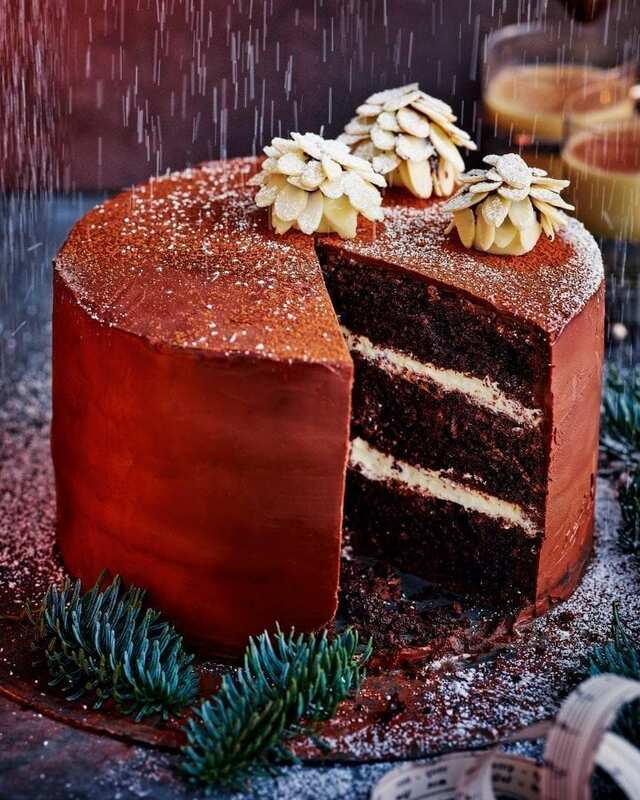 This glorious cake is a boozy showstopper – strictly for adults only. Slice through the chocolatey icing to reveal the rich interior filled with rum-laced eggnog custard… it’s a triumph. Heat the oven to 180°C/160°C fan/gas 4. In a large pan over a low heat, gently warm the coffee, chocolate and butter until the chocolate melts. Mix the cocoa powder and sugars in a large mixing bowl, breaking up any lumps. Using a balloon whisk, gradually whisk the melted chocolate mixture into the bowl. Add the eggs, whisking until thick and smooth, then whisk in the buttermilk, vanilla extract, flour and bicarb of soda. Divide the batter equally among the 3 tins and bake for 30-35 minutes or until a skewer pushed into the centre comes out clean. Leave for 5 minutes, then turn out onto a wire rack to cool. Meanwhile make the filling. Heat the milk and vanilla seeds and pod in a pan until just starting to steam. In a medium heatproof bowl, using a balloon whisk, beat the sugar, cornflour and egg yolks until thick and creamy. Slowly whisk in the warm milk mixture until smooth. Return the mix to the pan and put over a low heat, stirring all the time, for 10-15 minutes or until thickened. Remove from the heat and discard the vanilla pod. Pour the custard into a lipped baking tray and leave to cool. Whisk the double cream to soft peaks. When the custard is cold, spoon into a large mixing bowl and beat using a balloon whisk until smooth. Gently whisk in the whipped cream, then stir in the rum/bourbon and nutmeg. Chill for at least 15 minutes. For the ganache, melt the chocolate in a medium heatproof bowl set over a pan of simmering water (don’t let the bowl touch the water). Set aside for 5 minutes. Meanwhile, warm the double cream in a pan until steaming, then turn off the heat. Using a balloon whisk, gradually but vigorously whisk the cream into the chocolate until you have a glossy ganache. If it seizes add a splash of boiling water and beat vigorously again. Set aside. When the cakes are cool, put one sponge on a platter and spread over half the eggnog filling. Top with another sponge layer and spread over the remaining filling. Top with the final sponge, then generously spread the ganache all over the cake top and sides, smoothing with a palette knife as you go. Put the cake in the fridge for 30 minutes to set. Sift a little cocoa over the top of the cake to serve – or dust with icing sugar if you prefer. Freeze leftover egg whites in a freezer bag marked with the date and number of whites and use within 3 months. Make the sponges up to 48 hours ahead, cool and wrap in cling film and keep in an airtight tin. The filling can be made up to 24 hours ahead and kept in a sealed container. The cake will keep for 3-4 days, covered in the fridge.